You might not think it, but a lot of magical creatures are held down by a bunch of rules. Take leprechauns, for instance. Not only are they required to collect and protect pots of gold, they’re also obliged to give it away to anybody who stumbles upon the end of a rainbow. Then you have genies, who spend a lot of their lives tucked away in lamps and only get to come out when they’re required to serve someone else. Heck, even Santa Claus himself is locked into a specific set of tasks for at least one month every year. That’s where fairies have it made. What exactly is a fairy’s job description, after all? Fluttering around being pretty and whimsical, and maybe casting the occasional enchantment or sprinkling some fairy dust? As magical gigs go, that’s kind of a sweet deal. The work is easy and enjoyable, you set your own hours, and you don’t have to deal with greedy treasure hunters or ungrateful lamp-rubbers like some other mythical folks we could mention. Show the world you’re on board with the chillest of magical beings in this lavender polyester ensemble, featuring a corset top dress with elastic and lace up the back and a sheer center with lace up the front. The layered skirt features a jagged hemline and a satin underlayer. And for the crowning touch, a pair of wire frame wings fits comfortably over your shoulders. 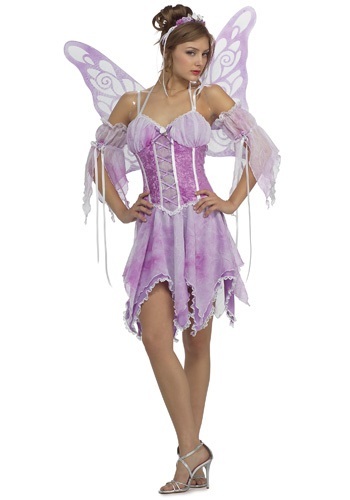 It’s just the ticket for getting down to serious fairy business. Oh wait, that’s right - fairies don’t really play that. In that case, go ahead and have fun!